GAUGE; an AI-driven mobile market research platform fundamentally changing the way successful companies make decisions. Brandon Andrews is co-founder of GAUGE; an AI-driven mobile market research platform fundamentally changing the way successful companies make decisions. 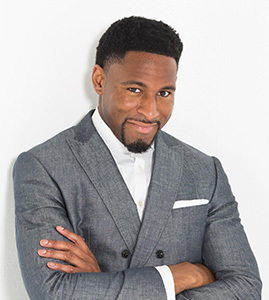 As Senior Consultant at Values Partnerships he leads the company’s work on technology and entrepreneurship, including leading a nationwide casting tour focused on bringing more diverse ideas and voices to ABC’s, Shark Tank, and advising/supporting businesses. Named a Global Innovation Fellow by the U.S. Department of State, he has traveled the world speaking on entrepreneurship and innovation. In 2018, he managed the #TechtoWealth Tour with DJ Young Guru. Designed to get 10K people of color coding, #TechtoWealth brought tech events to WeWork locations in the final six OTRII Tour cities + BET Hip Hop Awards with $1M in coding scholarships available from Opportunity Hub and Flatiron School. He worked with NBCUniversal Cable Entertainment to refresh their Erase The Hate campaign, including building the first accelerator for organizations fighting hate. In 2015, he worked with A+E Networks, iHeartMedia, and the United Way to develop the Shining A Light Concert for Progress on Race in America, Shining a Light Fund, and Conversations on Race in America documentary. Previously, Brandon worked on public affairs, technology, and real estate communications at MWWPR. He spent 5 years in the U.S. Senate where he handled technology, small business, and defense policy. He provides commentary on policy, politics, and technology on TV, radio, and the web.